Before joining any branch of the military, you should do your research and figure out a few areas where you would like to specialize. From computer sciences to special operations and everything in between, the military will take your interests and find a home for you. If you have done your research, you can help guide the recruiters in a general direction of the type of job you would like to perform in the military. When joining the Marine Corps there are many things to consider. To start off considering your physical fitness and what job you want to do. First, out of all the branches of service, the USMC has the most difficult physical fitness standards. The timed run is longer (3 miles) and the pull-up / flexed arm hang exercise is also tested for Marines. Rucking, which is walking fast while carrying a backpack and other gear and weapons will also be part of your training regardless of your job you seek. The saying, “All Marines are Riflemen” is not a myth. Regardless of your MOS, all Marines are considered to be Riflemen first, and whatever MOS (job) they happen to hold, second. In fact, the Marine Corps has even been known to deploy Band members to combat zones and use them on combat patrols. So be prepared for the physical fitness standards before you attend boot camp. Your recruiter will usually make sure you are prepared before you join the Marines. As a country, the United States has continuously increased in weight and body fat percentages over the years. In fact, the number one reason why young recruits cannot join the military is due to not reaching the height/weight standards of the military in general. Previous generations fought with lack of a high school diploma, medical disqualifications, criminal records as the main reasons why they could not join the military. Meeting a higher than average fitness standard prior to joining the military will help you graduate with fewer distractions, learn your job better, and statistically less likely to become injured than recruits who are not prepared. Secondly, selecting a skill should be something that you are truly interested in pursuing. The Marine Corps has over 180 enlisted jobs, which are called "Military Occupational Specialties," or "MOS." 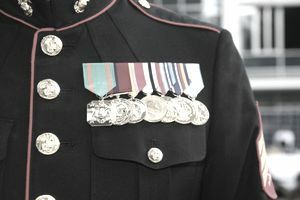 Because the Marine Corps gets much of their non-combat support from the Navy (medical, dental, chaplain), their job ratio is heavily weighted toward combat jobs, however, with the everchanging needs of the military, jobs relying on highly technical skills are important for the Marines to recruit. Jobs that require computer networking skills, electronic communications abilities, and more high tech jobs are continuing to grow in importance as the military needs these capabilities not just for operational requirements but for Marine morale and personal time as well. It's almost impossible to get a "guaranteed job" in a Marine Corps enlistment contract. When an applicant walks into a Marine Corps Recruiting Office, he/she is expected to " want to become a MARINE," with actual Marine Corps job a secondary consideration. There are many other MOS career fields ranging from linguists, motor vehicle transport and maintenance, food services, security, and even the band. If you are considering joining the military, think about what skills you want to learn and how you want to serve your country. Then find what branch of service is right for you as you will find research into a future career path should not be something left to other to decide for you. You drive the conversation and find a job that interests you, do not let the needs of the military tell you what you will specialize in.